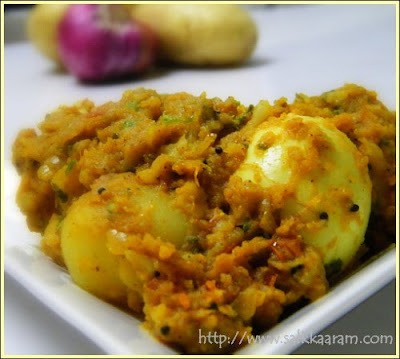 Potato Egg Chilly Masala | Simple and Delicious ! Do potatoes cause gas?Read an article that says -potatoes don’t cause gas but they bring out gas from stomach that is already settled .Not sure about the authenticity of this info,but its hard to totally ignore this veggie,right? Potatoes with skin is a good source of dietary fibre,so its good not to peel the skin before use.I had this so called habit of peeling skin every time,now started making bhajis with skin.Heard that its not good keeping potatoes in refrigerator,as it converts the starch in potatoes to sugar! Chop them into medium size pieces. Chop onion, put in a grinder, just crush it. Heat oil, saute onion and garlic - ginger paste. Do this until onion is semi transparent. Add all the powders and stir. After 1 minute , add thinly sliced tomatoes, green chilly and coriander leaves. Add salt, let it cook for a while, until the tomatoes are mashed well. Put potato pieces ,eggs and mix well. Gas or not - we love so much the tuber! I like the masala . 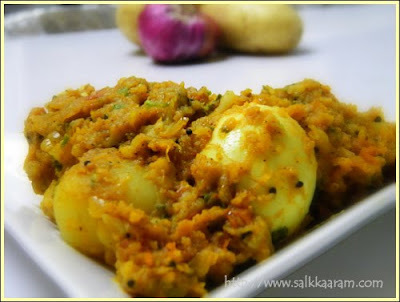 I am the only one who is wild about egg curry in my family so i hardly make them saying what is the use in making for one. Yum! What a delicious looking combo. Have to try it for veg nights. Happy New Year, thanks for sharing all your wonderful recipes. Love potatoes in any form! The combo looks delicious! Seena this looks really tasty. First time here,will follow you surely.